Becky’s path led her from a small town in Utah to a career in the Navy. Graduating from the Naval Academy, she served her country 9 years as a Naval Intelligence Officer and Anti-Terrorist Analyst, keeping track of threats to Americans worldwide. Today, as a CERTIFIED FINANCIAL PLANNER™ practitioner and CPA, she uses the values instilled in her in the Navy - values like duty, honor, and service above self - to help you find solutions to your financial needs. "My clients often tell me that I can make complicated concepts easy to understand. And, if I don’t have the answer, I’ll find somebody who can help us figure out the best solution." Becky has been married to Jasper, another Naval Academy graduate, since 1991. 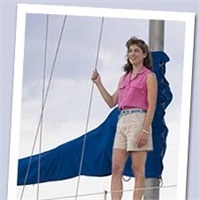 They settled in the Chesapeake Bay area after their active duty years in the Navy and frequently race together in local sailing regattas.